Mazzin (Ladin: Mazin, German: Matzin) is a comune (municipality) in Trentino in the northern Italian region Trentino-Alto Adige/Südtirol, located about 60 km northeast of Trento. In the census of 2001, 381 inhabitants out of 440 (86.6%) declared Ladin as their native language. 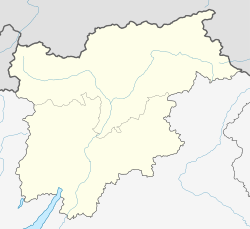 Mazzin borders the following municipalities: Canazei, Campitello di Fassa, Tiers and Sèn Jan di Fassa. ^ "Tav. I.5 - Appartenenza alla popolazione di lingua ladina, mochena e cimbra, per comune di area di residenza (Censimento 2001)" (PDF). Annuario Statistico 2006 (in Italian). Autonomous Province of Trento. 2007. Retrieved 2011-05-12. This page was last edited on 5 March 2018, at 08:14 (UTC).